TRUE SKI-IN & SKI-OUT 2 bedroom condo! Right on the Ski Slope! Just cruise down 250 yards to the Wizard High Speed Quad chair at Whistler's Blackcomb Base. Fully equipped kitchen; in-suite clothes Washer & Dryer. 50 unit family oriented building. * Spacious 1,025 sq ft Condo - casual elegance with a fireplace and mountain views, overlooking pool, courtyard & common BBQ. AC in summer months. 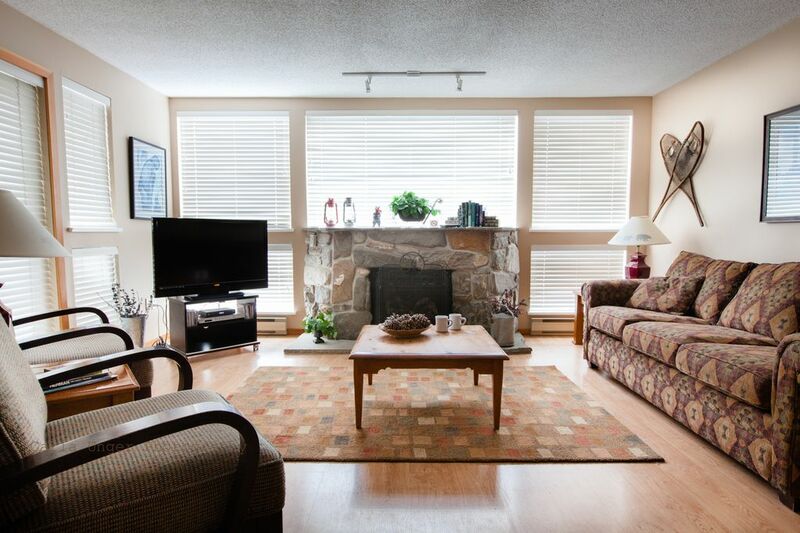 Keywords: Spacious Ski-in/Ski-out -1025 sq ft on one floor, fully equipped kitchen, gas fireplace, in-unit washer & dryer, great Mt. views, free secured parking, elevator, front desk, 50 unit family building, large heated Swimming pool, 2 Hot tubs, free High Speed internet, 3TV's, balcony overlooks pool, free shuttle bus to Whistler village, or 10 minute walk. We, the owners Neil & Toni Unger, are Whistler skiers. Thus, we will help you and recommend the best deals available, rentals, restaurants, shopping, and other Whistler activites. We will do our best to make sure that you have a great holiday. As Whistlerites, we purchased 218 Greystone Lodge in 1999 as a rental ski-in/ski-out property.We knew it was one of the best built buildings in Whistler; family oriented with over sized rooms. We have enjoyed meeting many guests (& repeat guests) over the last 19 years. We continue to enjoy introducing people to the best skiing in North America! Separate Clothes Washer & Clothes Dryer - one of the few suites in Greystone Lodge (let alone Whistler) that has both a washer & dryer right in the condo! FREE parking - height limit 6 ft, 8 inches Free shuttle bus to the village or a 10 minute walk; Secured ski lockers; River Rock stone fireplace and mountain views. Quiet family oriented building with 50 units. A 5 to 7 minute walk to the Whistler Village! Or free shuttle bus every 7 minutes during ski season; every 15 minutes during none ski season. Yes - Panoramic! Wizard Chair, mountains and Greystone's court yard with outdoor pool and hot tub. At the end of the day, ski down the Cruiser run and right into Greystone Lodge. Tired legs - you can download. Complimentary, secured parking: - 2 garage levels of underground parking. Each TV has it own individual cable box. Mountain views, over looks the Outdoor pool & hot tub, courtyard. Ski In / Ski Out - Situated Right on Blackcomb Mt. Our condo is on the Main floor (2nd floor) wheelchair accessible.